We can agree that it’s an Oreothlypis, right? The face pattern and bright wing edgings would make me call it a Nashville; any reason to think something else? Rick, what is driving me nuts about this bird is the lack of yellow on the chin. That, and the color of the legs and feet, which in the Peterson Field Guides Warblers are shown as always black, though the internet is awash in images of Nashvilles with pale feet and legs. 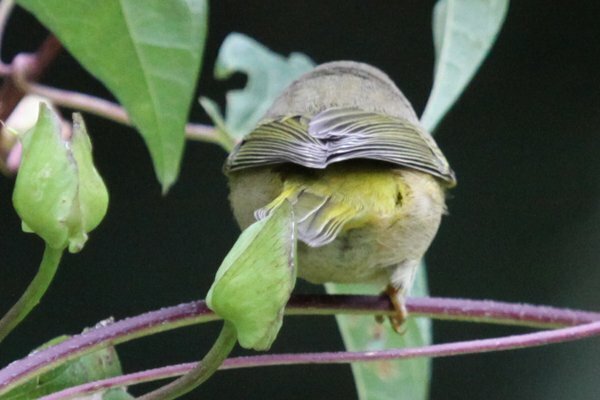 By the way, googling “Nashville Warbler feet” made me feel dirty for some reason. I’m copying the Birds of North America bit on bare parts, mostly because I want to see someone tell me what the age of this bird is based on the toenails. In juveniles, feet pinkish buff, becoming dusky with age; toes and claws olive above, dull wax yellow below (Oberholser 1974). In adults, legs blackish; feet olive brown or olive gray, claws raw umber (Oberholser 1974). And I’m not seeing anything other than Nashville. How about a Connecticut warbler? @Rick and Jason: Have either of you ever seen a Nashville without a yellow throat? @Jason: Who knew that you could age a warbler on its toenails? That is just disturbing. Orange-crowned would have a broken eye ring. My vote is for drab 1st fall female Nashville. Sibley show’s them as having a grayish throat and there are Google images that match your photos pretty well. Too bad it isn’t a Virginia’s! Great bird and great photos regardless. I also think it’s a young Nashville Warbler. Corey — I have seen Nashvilles this dull, with very little yellow apparent on the throat. But as in this bird, the face pattern and the bright wing and rump give them away eventually. Was your bird doing a lot of tail wagging by any chance? My first impression was pale Nashville, and I still don’t see anything to convince me otherwise. I’ve seen a few rather washed-out first-year NAWAs over the years. In the Nashville camp I’m afraid. The throat may not be yellow but is also isn’t really anything else per se. The Oporornis usually have something going on, either a hood, or a collar, or something …. @All: I’m convinced it is a Nashville at this point but to me it is an odd Nashville. @Rick: It was pumping its tail occasionally and that with the bright rump and more white beneath than I am used to is making me think about subspecies. Aha, yes. 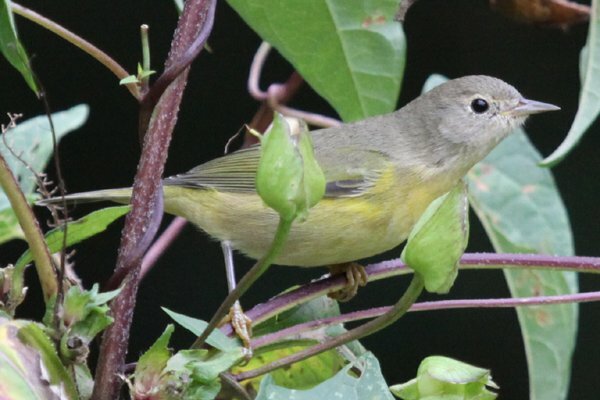 The Calaveras Warbler hasn’t been recorded in NJ yet, if rightly I recall, but I’ve seen one candidate over the years, a markedly late bird pumping its tail furiously in Mercer County a dozen years ago. Suppose you don’t have a front view? I’m not convinced there isn’t a bit of very pale yellow. Got good looks at one today and I’d say the throat was more creamy white than any shade of yellow. I seem to remember reading about possible Calaveras on the east coast, but don’t remember any details. I also suspect a large number of birders wouldn’t know what to look for (me included beyond the tail pumping). If we’re checking super-late Wilson’s now for the bright western birds, Nashville can’t be far behind though. It looks like a Nashville Warbler (drab 1st year). I don’t see any other warbler that matches all these field marks. Sibley’s guide shows the drab 1st year with virtually no yellow on the throat.